Oh yes, it's yet another haul post! I know that I've been hauling lots recently, from the Illamasqua sale, the KATE sale, a Sleek haul (no sale, though). So why am I still hauling? Because it was on sale, duh! So what was on sale? 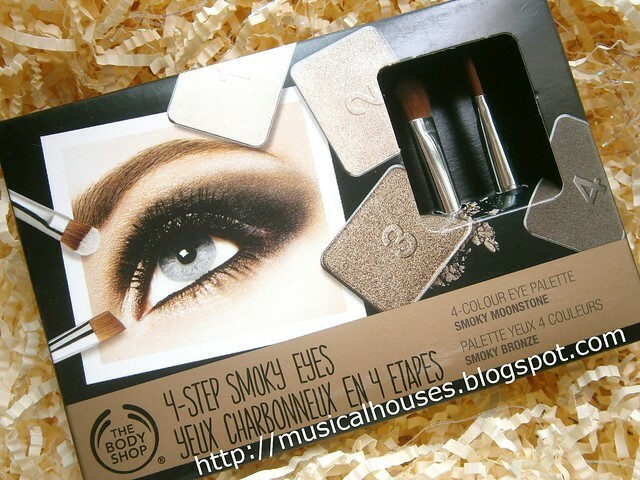 First was the Body Shop Smoky Moonstone Palette. You know, I've no idea whether the proper spelling of this is "Smoky" or "Smokey", but my eyes have always preferred the latter (when I see the former, my mental pronounciation of the word is always "smock-y", instead of "smoke-y" for some reason). I suspect either is probably acceptable depending on your geographical location, like one of those "to-may-to"-"to-mah-to" words. But anyway now you know my preference. 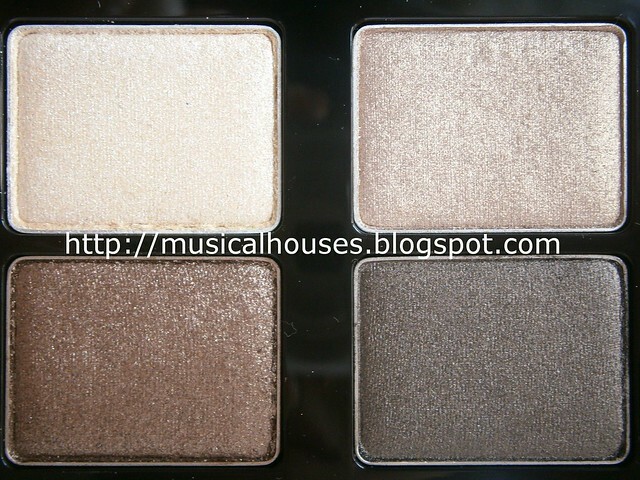 The Body Shop Smoky Moonstone Palette is basically a nice palette of very frosty neutrals. A cream, a beige, a gorgeous neutral antique gold (my favourite shade in the palette! ), and a deep neutral brown. So lovely! It even comes with two teeny weeny travel brushes, which is pretty. Four pretty neutrals. Best part about them? They were on sale! The only thing about these though, is that the texture seems a little flaky (contrary to all those blogposts saying the texture was smooth - ugh, it's not), and you get lots of fallout if you use a sweeping technique with a brush, so maybe a stippling technique or a sponge applicator would work better with these. 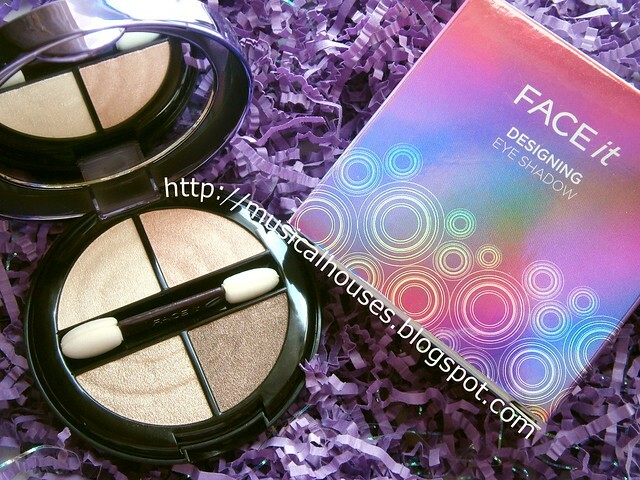 The second thing that was on sale was from Face Shop, namely the Face It Designing Eye Shadow in 04 Gold Brown. The Face Shop is a Korean brand, so naturally the Engrish product description tickles me: "4 color eye shadows for stylish and trendy eye looks. Plenty pearl added to make eyes look shiny and moisturized." But surprisingly, the description is spot on. The 04 Gold Brown palette I got was a set of neutrals, but there is a very strong frosty finish, probably the "plenty pearl added". Pretty neutral colour scheme, like the other eyeshadow palette I bought. Because the finish on the Face It Designing Eye Shadow is also rather frosty, I also found a similar problem with application. Fortunately, the Engrish directions are helpful in this regard: "Use the small brush within or your finger to spread out adequate amount around the eyes. Pearl effects are best seen when used finger tips." I agree with the directions, but fingers are never my preferred instrument for application (not as sanitary in my opinion), but a sponge tip applicator is a great substitute. What can I say, I love my neutral palettes. They're just so pretty! So there you have it, my awesome haul, which really consists of two shimmery eyeshadow palettes with similar shades, and similar frosty finishes. Good thing both were on half price when I bought them, because this totally justifies owning both! 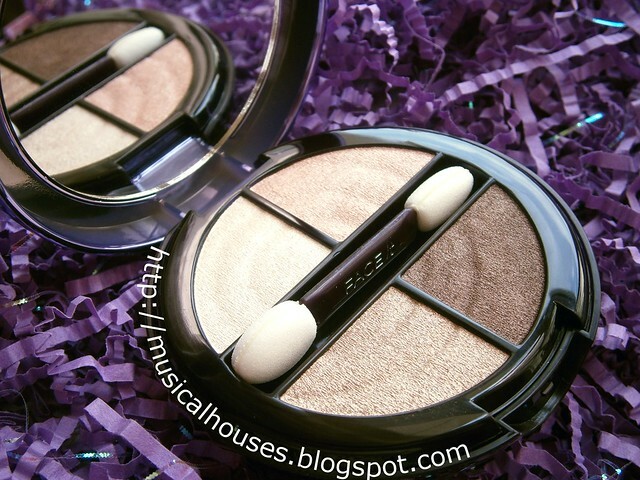 :P (Yes, I did say I was a sucker already...) I love my neutrals, so this is a great addition to my neutral shadows family. That first quad looks so pretty. I want it.. 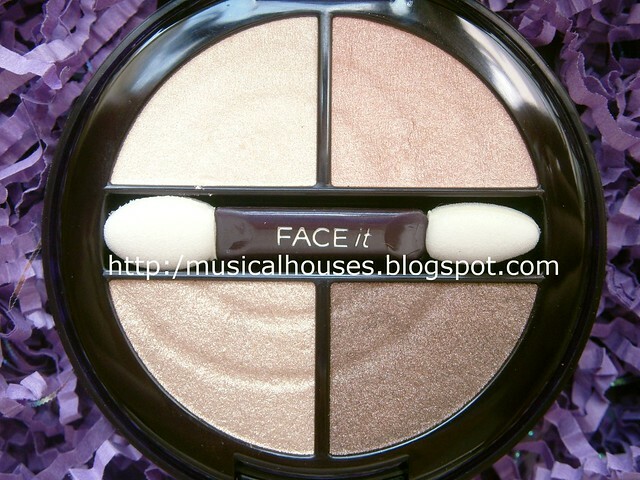 I have Face Shop Face It Designing Eye Shadow in 04 Gold Brown and I too bought it on sale. Sad to say I accidentally dropped the palette and the dark brown eyeshadow 'broke' so now there's only 3 of the eyeshadow remaining.